BoLASEPaKO.com - a simple view on Singapore Soccer: "No Point Being A BIG FISH In The Pond"
"No Point Being A BIG FISH In The Pond"
"Resources have always been a key constraint faced by the FAS. This record deal represents a great vote of confidence for our programmes, ...The money will be spent wisely on the development of our most promising young talents, and to build the next generation of National Team players." 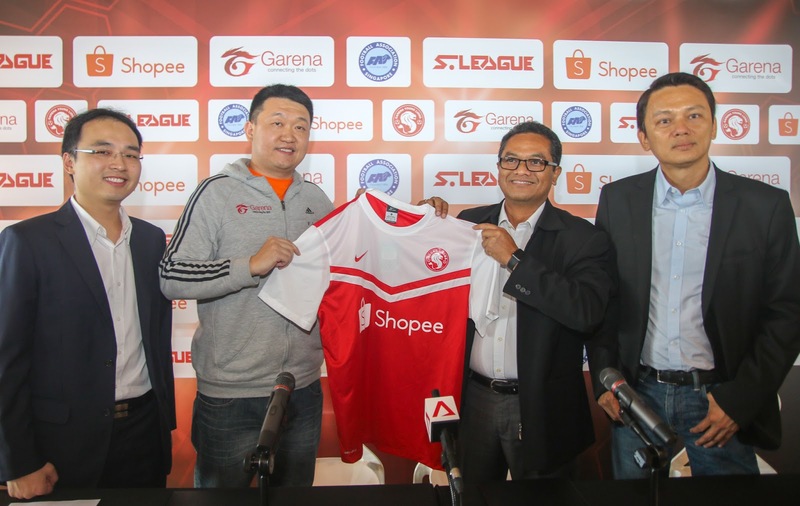 declared Zainudin Nordin (pictured above, second from right), the president of Football Association of Singapore (FAS) after the landmark deal that saw Garena, Southeast Asia’s largest Internet and mobile platform company, named as the main sponsors of the de-facto national developmental squad playing in the S.League. If people do not pay close attention to those words appeared in the press release that was released weeks ago, would they think the $4,000,000 deal was meant for youth development and not solely for the newly-named Garena Young Lions (GYL, formerly known as Courts Young Lions after the partnership with IT and furniture retailing giants ended last year)? SHOULD PRIME LEAGUE BE IN FOR THE WINDFALL? As what the former mayor of Central Singapore CDC highlighted "money will be spent wisely on the development of our most promising young talents, and to build the next generation of National Team players", so there should be no doubt it would be for the betterment for largely flawed youth development of local football on whole. But it is not the case when it is meant to be the package solely for the mainly Under-21 team for the next two years. It's not difficult to ask if the Prime League, the lower tier league below the S.League, should be the appropriate beneficiary of this windfall? Since the competition that comprises of teams from six local S.League clubs (sans the likes of Albirex Niigata(S), Brunei DPMM and GYL) plus two National Football Academy (NFA) age-group teams - NFA U17 and U18, is to serve as a breeding ground for players for bigger stage. Despite the importance of its mission, the league, however, is a much neglected tournament with frequent changes of fixtures, lack of training facilities, etc. Lamented a former player who weighted in his opinions on those mentioned problems. "One of those problems we have in Singapore is the lack of fields when those stadiums are not owned by the clubs and resulted issues like clubs can't conduct their training sessions at their allocated grounds. "Also most teams don't train together well enough when some players can't attend training due to factors like school commitments, etc." "My former club would issue letters to seek permission from our schools for early release to allow us to attend our training, but then they have no obligation to accommodate those requests." said this former player who left the scene to seek employment in other industry. "As the result, it affected the coaches who wanted to plan their training in getting their players to hit a certain peak level in their performance." he added. Furthermore with those two NFA teams taking on teams filled with players of older age-group in the Prime League and likewise for the case of GYL (many of whom are under the age of 21 in this year's campaign) in the S.League, questions were raised if such an "unbalance" circumstance is detrimental in players' development, since at such age-group is considered a “make-or-break” period in their game advancement. Those concerns are not unfounded of when the past statistics did not convince the presence of having the developmental squad had enhanced the standard of play in the league and many notable names emphasized having played under guidance of senior players during their formative years improved their game. Nonetheless, such notion was disputed by one observer when sharing his thoughts on this possible "detrimental" factor. Speaking on condition of remaining anonymous, he opined:"They (GYL) may struggle in the S.League but along the way they will develop and that's more important for them now, not results!" He applied the same argument on those NFA age-group sides competing in the Prime League when he continued:"They (NFA sides) have to be challenged. No point being a big fish in the pond, better be a small fish in the ocean!" "As coaches always said, you need matches to see how (and where) you stand. And these players will need to play against big and strong opponents to learn before playing on international levels. "These players (of NFA teams) are chosen as they're one step higher than their peers plying their trade in the Prime League." "Therefore, it is good that these specially selected groups of players will play and gel together as a team at that level before promoting to the next stage along with their coaches who have been guiding them." Concurring those theories was lifelong GYL fan Rennard Ho Zhao Xian who voiced his opinions in a relevant posting recently on this blog's Facebook page. He went on to suggest the inexperience of the developmental squad at the senior level that saw them being overwhelmed all along may not necessarily recur in either Prime League or even the amateur National Football League (NFL) level given the skill levels they possessed. Said Ho:"The Young Lions are in a weird position because they're too good for the NFL and the Prime League, yet (possibly) not good enough for the S.League. "We could either put the team in the Prime League - where they would secure victories rather easily or pit them against the likes of, let's say, Jermaine Pennant (of Tampines Rovers)." said the 19-year-old student citing a pre-season result that saw they defeated Geylang International Prime League squad on an eight-one scoreline. "Either way, the FAS seems to think that the Young Lions project has served Singapore football well, which cannot be fully proven right nor wrong, isn't it? "Match experience does help these players, and given that we only have one professional league we don't really have a choice." Instead of grouping a bunch of youngsters with some seniors to "let them learn", how about dismantling the team and distribute them to the 6 local S-League clubs? You always learn when you have to fight for your place and gain experience from the challenges in training & playing alongside seniors in matches. You become better. It's proven. Garena can be the sponsors of the Prime League. Make that a U-20 competition. It can be done.